Anger is the spirit of the age. Frustration and irritation towards politicians and others in positions of influence is now commonplace. The welcome death of deference in recent decades appears to have turned to something bordering on blanket contempt for authority figures. The strong sense of grievance in much of rural Ireland is in keeping with the anger meme that has spread across the western world. Some rural dwellers claim the recovery is not being felt in their areas; that they are being ignored and neglected by the Dublin elites; and that they are losing out in all manner of ways. Some have even spoken of "the death of rural Ireland". Many rural TDs are not behind the door in playing on widespread anger to reinforce the sense of grievance in their constituencies. "Ireland stops at the Red Cow roundabout", one rural TD colourfully put it, in an effort, it could be construed, to inflame a sense of neglect that many feel in rural Ireland. Another has claimed that the recovery has not extended beyond the M50 motorway. These claims are both wrong and dangerous. They are wrong because there is very little evidence to support the notion that there is no recovery in Ireland outside the cities or that rural Ireland is in some sort of existential crisis; they are dangerous because government decisions taken on the basis of anger and emotion, rather than evidence and analysis, lead to more unfairness in society, not less. It is important to stress from the beginning that making these points is in no way to be anti-rural Ireland or to deny that people in cities on average enjoy higher incomes than those in sparsely populated places (the urban/rural income gap is almost universal owing to the nature of modern wealth-creation). Nor is to make a case against investment in and subsidisation of rural projects. Just as I support redistribution of wealth from the well-off to the less well-off in society, I also support redistribution from areas that are better off to those that are poorer. Solidarity is the glue that holds societies and polities together. But taking people's money from them to give it to others is a serious business. It should never be done lightly. A strong case always needs to be made to do so, both on grounds of equity and efficiency. In discussions on the formation of a government, there has been much talk about doing more for rural Ireland. Not all of the proposed measures require more cash. 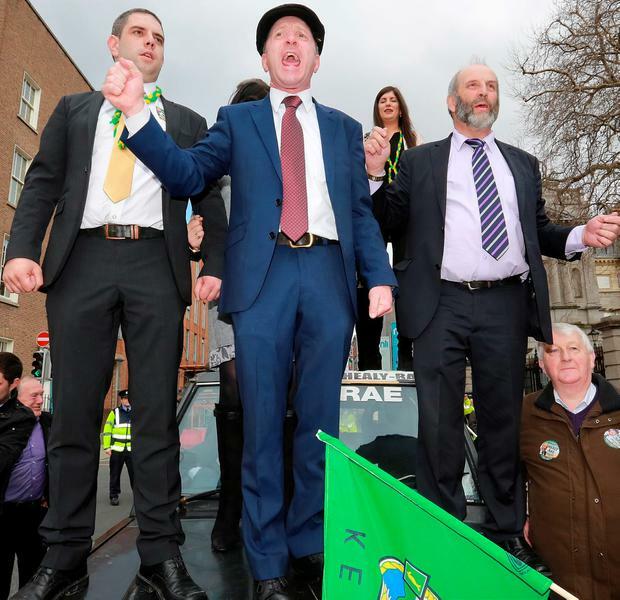 Perhaps the most symbolic of the demands being made is that a full Cabinet position be created for rural affairs, something that both Fine Gael and Fianna Fail are reported to have conceded. But as offers are made by the larger parties in return for the support of Independents, there is a real risk that politicians will agree to take from one group in society and redistribute to others when the case for doing so is based not on fairness or need, but on mere political expediency. There is a long tradition in Ireland of appeasing those who shout loudest with the resources of others, often others who have much less than those who make most noise. This has usually happened in an untransparent way and with little by way of justification. The many tax breaks that have built up over the years have all too often been granted willy-nilly. The benchmarking exercise at the height of the boom which resulted in huge public pay increases was based on a report which was never published. Too often, too little evidence and analysis is used when making decisions that impose costs on some citizens while making others better off. There is a real danger that this will happen in negotiations to form a government in relation to giving additional (still very scarce) resources to rural Ireland. While there are certainly parts of the country that are facing particular challenges, the notion that rural Ireland is dying is emotive nonsense. The claim that there is no recovery outside the Pale is plainly wrong. This may be best reflected, not in hard economic data, but in people's own opinions. In the RTE exit poll taken on election day just over a month ago, those leaving polling stations were asked how their personal financial positions had changed over the preceding year. An identical proportion of people in urban and rural areas - 48pc - said that their financial position had not changed. The share saying they were worse off was bigger in rural areas, but only slightly, at 29pc versus 25pc. The proportion of respondents saying that they were better off was 23pc in rural areas, only a little below the 27pc in urban parts. The fact that only a quarter of people nationally are really feeling the recovery reflects the depth of the hole out of which the economy has climbed and the fact that while the recovery has been real and solid, its scale has been exaggerated by grossly inflated GDP figures. •Average disposable income per person has increased in all 26 counties since the post-crash low point. No county has been left behind. The difference in growth in disposable incomes across counties is narrow and there is very limited evidence that the more rural counties are doing less well than the more urbanised counties. •In every region of the country unemployment has fallen and the numbers at work have grown from their post-crisis low points. Of the country's eight regions, three predominantly rural regions have recorded faster jobs growth than Dublin. •Talk of the death of rural Ireland is greatly exaggerated. The population of rural Ireland continues to grow, something that is in contrast to many rural areas across Europe, including in countries which had much shallower recessions than Ireland's. •Rural Ireland receives significant cash transfers from more urbanised counties. The average person in 21 counties receives more in social transfers than they pay in tax. It is the opposite in more urbanised counties. It is more than a little surprising that TDs who represent urban voters - including those representing areas of urban poverty - appear unwilling even to question the more fanciful claims made by some of their rural counterparts. While there are undoubtedly strong cases to be made for policies and actions aimed at problems afflicting rural areas, the most deprived in Irish society are those in the urban underclass. The needs of all groups and segments of society should be considered by the next administration, whenever it is formed. But given how tight available resources will be for the foreseeable future, there appears to be a stronger case for a minister for urban deprivation than one for rural affairs.